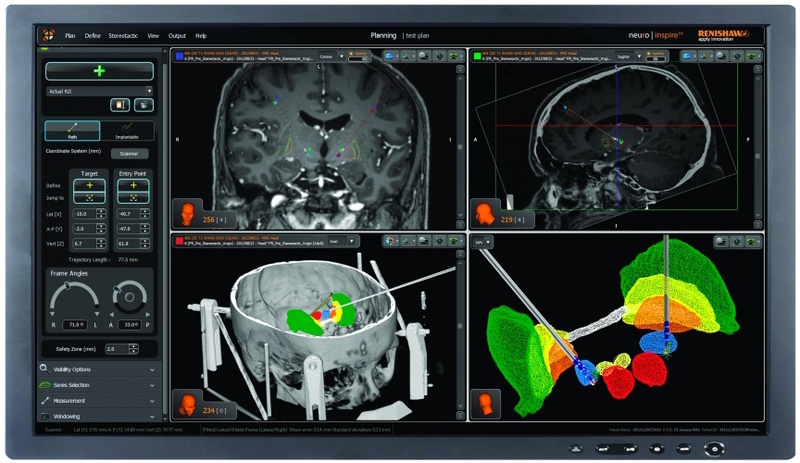 A woman experiencing up to six epileptic fits a day is recovering after an operation carried out with the help of Renishaw’s neuromate stereotactic robot. The stereoelectroencephalography (SEEG) procedure, conducted at The University Hospital of Wales, was the first of its kind to be carried out with robotic assistance in Wales. Cardiff University’s William Gray, Professor of Functional Neurosurgery, Neurosciences & Mental Health Research Institute used the neuromate robot, which helps to position probes accurately and steadily in the brain using MRI scanning images, during the surgery while he used intracerebral electrodes to measure electrical signals in the brain. Patient Denise Casey, from Neath, Port Talbot, was diagnosed with skewen epilepsy when she was 31, suffering up to six fits every day for the past 20 years. With the robotic arm, it took Prof Gray 55 minutes to identify and operate on the epileptogenic zone in a procedure that would normally take four hours. Follow-up surgery a week later was performed in the hope of relieving Denise of her epileptic symptoms. Prof. Gray is also a director of the University’s Brain Repair and Intracranial Neurotherapeutics (BRAIN) Unit which brings together experts from Cardiff University, Swansea University, Bangor University and the NHS. Denise has not suffered any fits since her operations in March.